Rats, Gary. I thought "Crumbling Chapel Hill" was the name of another blog you've franchised. Not that they would have the same breadth and depth of material that Durham has, but still. I was looking forward to learning about landscape changes in that town! Interesting how the extra brick facing (center of the wall that faces Roxboro) on the Roxboro store got removed at some point. Also interesting to see how Fowler's had many different personalities and locations. I bought my first bottle of wine at the Brightleaf Fowler's (located where Chamas is now) when I was seventeen. The drinking age then was eighteen but they probably figured that anyone buying wine probably wasn't abusing. (Yeah, right.) Anyway -- it was a gift for my dad. Really. Quick, grab your camera! They're moving farm outbuildings on Garrett Road today, just north of Durham-Chapel Hill Boulevard. I assume they're part of the Garrett Farm that you posted about a while back. The house is already gone. Any idea if/where they moved the house to and if the outbuildings are going to follow? Yeah - just my little joke. You haven't seen Imperiled Apex? Gary, if I were the sort to squee, I'd be squeeing right now. I used to LOVE going into this store. Granted, we didn't get to go in often because it was out of our budget, but they were the place in North Durham to get special cuts of meat for the holidays or ingredients unavailable at the likes of Winn-Dixie. It was crammed with all kinds of things that seemed so exotic to me at the time. I visited the Bright Leaf store once when I was back in town. It was lovely, but it just lacked that certain patina of disorganization that the old store had, the feel that said, "real foodies don't need no stinking oak shelf displays." The Roxboro Rd. store was a pawn shop for a while in the 80s. I bought the best typewriter I ever owned from there. I REMEMBER FOWLER'S FOOD STORE GROWING UP IN THE 1960'S. MY MOTHER WOULD PICK OUT HER MEAT AT THE BUTCHER COUNTER. THEY WOULD CUT AND WRAP IN BUTCHER PAPER. SUCH NICE PEOPLE WORKED THERE THEN. In fact, the Roxboro location was a pawn shop up until last year. I live nearby, but I'm not sure when the building was vacated. That pawn shop on Roxboro was pretty good, they had the best stolen chainsaws around. I was bummed about the Crumbling Chapel Hill too. I figured someone had to do it. 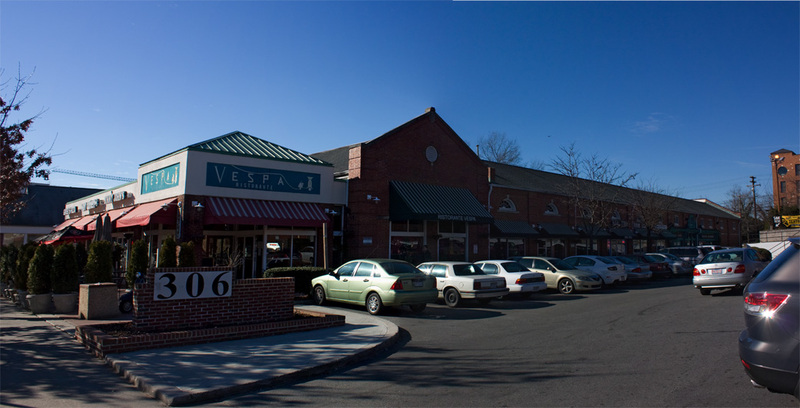 Then again, Chapel Hill's streetscape has been churning and changing continuously. When I first went there in 1983, many of the Franklin St. stores were still unairconditioned and had screen doors. There were half a dozen laundrymats, and at least that many crummy, tiny bars. There were even 3 or 4 combined during a brief fad for laundrymats that served beer. Very handy, get your clothes clean & get your buzz started in the afternoon. Then they raised the drinking age, and coffee bars invaded. But no coffee & laundry. Yes, the Chapel Hill Fowler's was exciting to this UNC freshman. It was perhaps not as exotic as the Roxboro and near Club one, but the Chapel Hill one was a wonderful jumble of staples and special items. Let loose with a checkbook, one could pick up a bunch of treats. The magazine rack was particularly reflective of Chapel Hill in the late '70s/early '80s...with all sorts of things and things I didn't know existed ("Blueboy"...really?). The legendary walk-in beer cooler was a great place to visit on a hot summer/early fall day when you were hopelessly sweaty. After my first visit, during orientation freshman year in '78, I came across a man propped up against Fowler's dumpster (NW side of the store) and nearly jumped out of my skin thinking he was dead. He was apparently just dead drunk and when I made a friend return with me he was gone. Coming from a small town with no character, I'd never seen a town drunk. Always something interesting at Fowler's. i wonder how many google searches of "crumbling chapel hill" just happened...trickery! I would shop here with my parents when it was a grocery store. They delivered too. When I was 18, I worked here for a few months with Bob and Dan Fowler. It was a special place. You could consider it one of Durham's homegrown groceries that brought fine wines and culinary delights to a wanting community. A legacy to what, we all know today, as some of the "best eats" in the country. King's Red and White on the other corner at Club and Roxboro is makin' it's mark today; authentic since 1958. It's home for me! The Fowler's, BP and old hardee's on Roxboro road are going to be torn down and a new bp family fare and auto zone put back in their place. Looking northwest from Roxboro Road, 1950s. 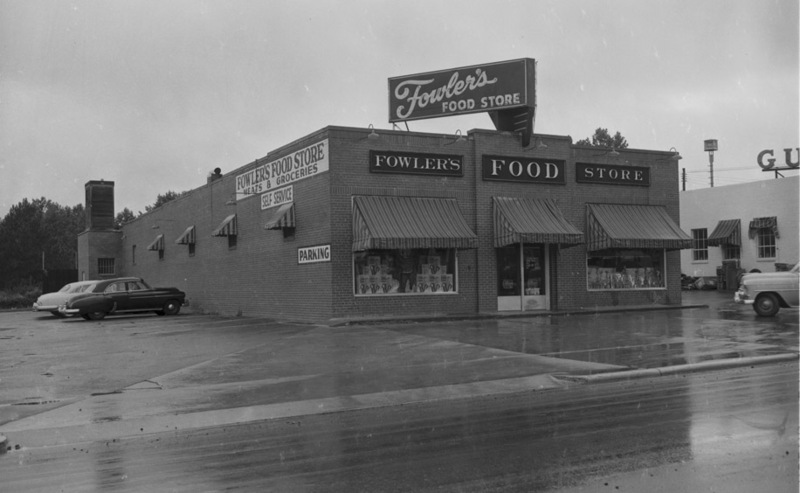 Fowler's Food Store was founded in Chapel Hill by the Fowler family in the 1920s. 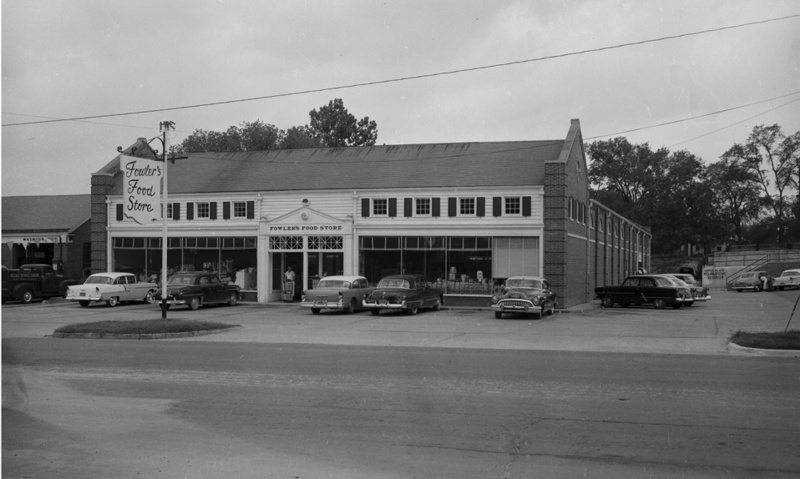 The store occupied several locations on West Franklin Street; in 1942, the grocery opened a Durham location on North Roxboro Road, just south of East Club Blvd. In 1950, the store is noted to be the "first modern super-market in the Bragtown area. They carry a complete line of quality meats, produce, frozen foods, and groceries, and feature quality, economy, complete variety, and home delivery. Owners are RL Fowler and MM Fowler, the former being in active charge." After the family sold the Chapel Hill store in the mid-1970s, the Durham store became the one-and-only. The grocery changed at that time to focus heavily on wine and more 'gourmet' food items. 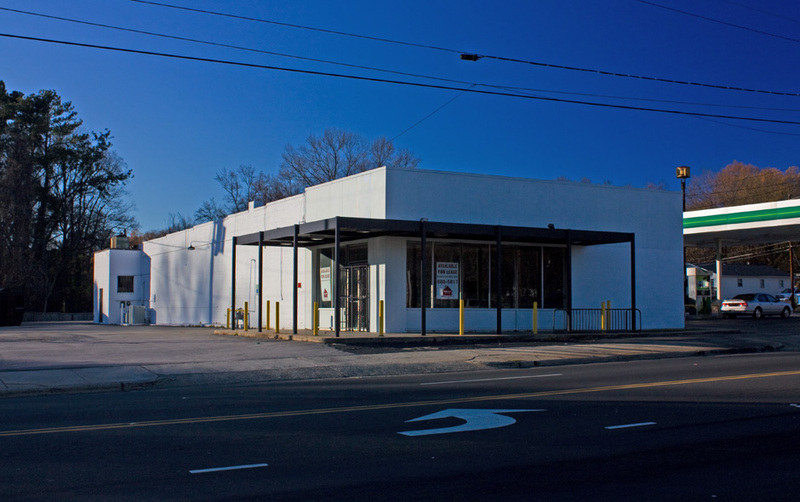 It remained at the North Roxboro Road location until ~1981, when it became one of the original tenants of Brightleaf Square, before moving to the former Dillon Supply building on South Duke St. Fowler's closed for good in 2006, and Parker and Otis subsequently assumed the gourmet grocery mantle in that space. The former grocery on North Roxboro is currently unoccupied. Find this Durham spot on a Google Map.